One of the perks of our business is that we never stop trying to find new cantine (wineries) to add to our growing list of artisan winemakers. 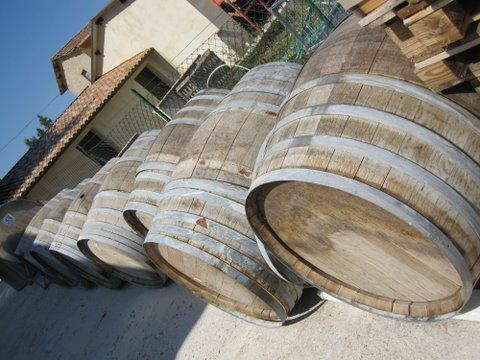 The winemakers are real characters and each one brings something a little different to the winemaking process. Each one has their own ideas and their own quirks that make each wine from each cantina just that little bit diverse, a little different from the next. We came across a cantina the other day right in the heart of the Massa Martana hills and we made an appointment to meet the owner/winemaker the following day. We arrived at the appointed time and made our way to what we thought was the way in, but found a few workmen busy enlarging the working space of the cantina, bit of a building site, but still, somehow charming. "Arriva" - ("He's coming") - said the daughter. She was busy with a family from France while the wife was noisily lugging heavy boxes of wine from another store to another with a sack barrow, the dogs wandering around the courtyard looking for someone to play with them! 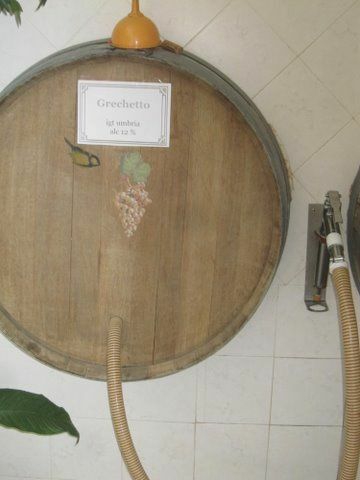 Over in the corner of the room were 3 wine barrels sticking out of the wall with hose pumps like you'd see at petrol stations for filling almost any sized bottle with 'vino sfuso' which translates as loose wine - not a great translation, but you get the picture! This is the wine the locals come and buy, they arrive in their 'apes' (pronounced app-ays) their tiny 3 wheeled flat-bed trucks with a cab, a bench seat and scooter handlebars in the middle for a steering wheel - when you see these buzzing about the countryside with 2 people squeezed into the cab, it's always amusing to see the driver awkwardly bent over grasping the handlebars at an angle that can't really be that safe - yet somehow, it just works here! They bring huge 25 or 50 litre glass jars to fill with their chosen bianco (white) or rosso (red) or these days, something fairly new here, rosato (rosé). When the owner, Omero, made his appearance the family was complete and a certain familial craziness descended on the tasting room with banter shooting back and forth between the husband wife and daughter! We were given a plate of bruschette with their own amazing olive oil drizzled over the toasted bread. Then Omero walked us through his wines, describing each one, what grapes were in each one, the methods used to make the wines and how long they had been aged. 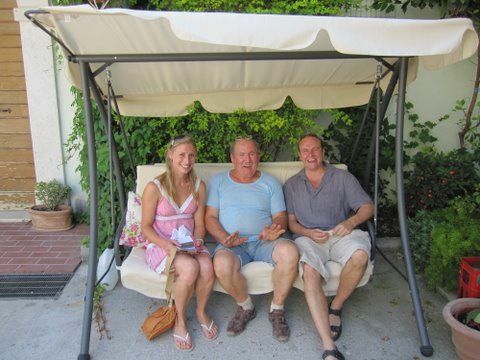 He has deservedly won awards for both his wines and his olive oil, all of which are certified organic. His Sagrantino is delightful and the Sagrantino Passito is one of the best we've tried. The whites are well balanced and fruity. Omero is gregarious and open, rightly proud of his wine and olive oil. And now we know that our guests will love meeting him too! Olmero with a couple of our guests!